Elkmont, a former logging town and resort community, is a wonderful place to visit in the Smokies anytime, but especially in June. Why? For 2 weeks in mid-June, it's peak viewing time to see fireflies (a.k.a. lightning bugs). What you're seeing is a mating display. The males fly while they flash. Femals remain stationary and flash in response to the males. Did you know? Fireflies live as adults for only 21 days. And we think our life is short! Prime places to see fireflies are the Jakes Creek and Little River trails. --Cover your flashlight with red or blue cellophane for an even better light show. --Only use your flashlight to get to your viewing spot as a courtesy to others. --Keep your flashlight pointed to the ground, also as a courtesy to others. Cucumber Gap Loop This is a great hike for those who like variety. You start off seeing some historic buildings on Jakes Creek. On Cucumber Gap you'll enjoy wildflowers and ridge hiking. You'll end with a pleasant stroll down Little River Trail with the soothing sounds of the river to carry you back to your car. It's an easy hike, so bring the kids too. Remember to bring your flashlight if you're coming in June to see the fireflies. 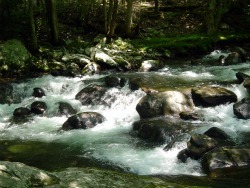 This hike is near Elkmont and the total length is 5.5 miles. Metcalf Bottoms/Little Brier Gap There are lots of neat historical sites to see on these trails. You'll see a schoolhouse on Metcalf Bottoms and a cabin on Little Brier Gap. These trails are between the Townsend entrance and Elkmont. The total hike length is 3.6 miles. If you like long, quiet hikes this one's for you. We didn't see a single person the time we hiked it. If you're going to hike the whole thing, it's best to start at the top of the mountain, at the trailhead off Clingmans Dome Road.